America was born in an act of rebellion, and protest and dissent have been crucial to our democracy ever since. Along the way, movements for social justice have created a wide array of pamphlets, broadsides, newsletters, newspapers, and even glossy magazines. 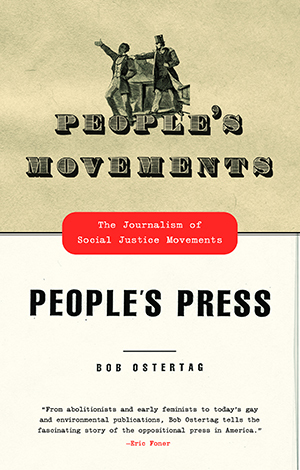 In People’s Movements, People’s Press, Bob Ostertag brings this hidden history to light, examining the publications of the abolitionist, woman suffrage, gay and lesbian, and environmental movements, as well as the underground GI press during the Vietnam War. This fascinating story takes us from the sparse, privately owned media environment of the nineteenth century to the corporate media saturation of the present. Within these publications, we find powerful debates about the direction of a movement; impassioned cries for rights and civil liberties; lonely voices reaching out to others after being alienated by the mainstream press and the unaccepting world around them; and demands that now seem surprisingly reasonable but were at one time quite revolutionary. With both plain language and rigorous scholarship, Ostertag tells the story not only of the publications but the many colorful characters who created them. The story of the social justice movement press is deeply intertwined with the story of the movements themselves. In fact, Ostertag shows how reliance on the printed word fundamentally shaped what we now know as social movements. People’s Movements, People’s Press, then, offers a new view from the ground up of social transformation in America and raises the question of how social movements will change as they move from print to the Internet as their primary means of communication. As large corporations take over every media outlet available, People’s Movements, People’s Press reminds us of the great value and historical importance of independent, activist-driven media. “People’s Movements, People’s Press is an extremely useful intervention into the historical debate of the meanings of journalism, democracy, and their various uses and complications. Its measured tone and extensive research are particularly welcome, given the potential volatility of the topic. Highly recommended.” —Eric Alterman, author of What Liberal Media?